Explosive demands for Licensed Nursing Assistants and high turnover rates in the industry create numerous employment opportunities throughout Vermont. More than 62 percent of CNAs go back to school to advance to other careers in health, including nursing and medical assisting. Although licensed nurse assisting is the fastest and easiest way to enter the healthcare industry, the emotional and physical demands of the job along with low salaries (compared to other careers in health) and limited opportunities for growth increase the turnover rate as LNAs move on to other careers. 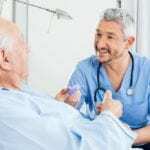 An LNA works as an extension of the licensed practical nurse in nursing homes, long-term care facilities, hospitals, clinics, home health care agencies, and community health centers. Training prepares students for the written and skills components of the state exam and helps them develop abilities to care for and empathize with the patients they serve. The Licensed Nursing Assistant program at River Valley Technical Center is a 100-hour combination of classroom and clinical instruction. The program helps students develop the skills necessary to care for and empathize with patients and perform nursing-related activities. Students can complete the program in 6 to 8 weeks depending on class schedule and clinical site. Attendance is mandatory for all classroom, lab, and clinical sessions to meet the Vermont’s Board of Nursing requirements. General admission requirements include a passing score on the Accuplacer Placement Test, two written references, and the ability to lift and move at least 40 pounds. Additional requirements include a current physical exam. Medical insurance, a negative tuberculin skin test, current AHA or ARC CPR for healthcare providers, liability insurance, and immunization (hepatitis B, MMR, chicken pox, and TDaP). The clinical site will require participants to undergo a criminal background check and BEAS consent. Tuition for the program is $950 and includes the course textbook. The American Red Cross LNA program prepares students for one of the highest demand jobs in Vermont. Throughout the program, instructors use classroom lectures, hands-on participation in the lab, and supervised clinical experiences in a skilled nursing facility to teach students how to care for residents of nursing homes, hospitals, and home health agencies. The program emphasizes the quality of life and safety for all patients. Flexible day and evening schedules are available, and students can complete the training requirements in just nine weeks. The program provides 150 hours of classroom, lab, and clinical instruction to prepare students for success on the Nurse Aide Competency exam. CPR and First Aid and AED certification are included in the Vermont Board of Nursing Approved program. Minimum requirements for entry include successful completion of a personal interview and screening exam, attendance of the information session, immunization, TB screening, a physical exam, and criminal background check. Applicants must be 16 years or older; a high school diploma or GED is not required. Tuition for the program is $585. Scholarship opportunities are available for qualifying students. Stafford Technical Center admits a maximum of 12 nursing assistant students with each cycle. The curriculum is designed to prepare students for practice as a Licensed Nursing Assistant to provide direct care to patients in nursing homes, hospitals, clinics, and home health agencies. Persons interested in immediate employment in healthcare can enroll in the 100-hour program and complete the foundational requirements in just 17 weeks. The curriculum includes classroom lectures, demonstrations and hands-on participation in the lab, and supervised opportunities to care for patients in a long-term care facility. The course includes BLS Healthcare Provider Course from the AHA to help graduates recognize and respond to life-threatening emergencies, administer CPR, and relieve choking in a safe and effective manner. Day, evening, weekend classes are available. Applicants must be 18 years or older and complete a criminal background check. Other requirements include signed verification of immunizations (MMR, Hepatitis B, TDaP, Varicella), medical insurance, personal interview and screening, and physical exam. The course tuition of $1,350 does not include the cost of textbook and clinical supplies. Genesis HealthCare trains Licensed Nursing Assistants on an as-needed basis. Graduates are eligible to take the state certification exam and care for patients in a compassionate and caring environment. Classroom and clinical training help student develop clinical skills and leadership capabilities and a commitment to excellence. Successful graduates go on to work with Genesis Healthcare where they serve residents under the direction of a licensed nurse. They admit and make assessments, take records, perform ADLS, provide direct care to ill residents, and clean equipment. Tuition is free. The Licensed Nursing Assistant program at River Bend Career and Technical Center is a 100-hour program that prepares students for entry-level employment in health care. Applicants must attend a mandatory orientation meeting where they will learn about the program policies and procedures, initiate required paperwork for immunization and background check, make the 50 percent deposit for tuition, and obtain the textbook and course outline. Students meet in the classroom on Tuesdays and Thursdays from 5:00 pm to 8:00 pm. Clinical experiences take place on Saturdays from 7:00 am to 1:00 pm and two Sundays from 7:00 am to 1:00 pm. Course topics include medical terminology, fundamentals of nursing, laws and ethics, communication skills, safety and emergency procedures, feeding and nutrition, basic nursing skills, infection control, vital signs, personal hygiene, and end of life care. The total cost of attendance is $1,350 and includes textbook, state testing, license, and criminal background check. Students employed by a Vermont health care provider may be eligible for a 50 percent tuition discount. The Licensed Nursing Assistant course at the Hartford Technology Center meets the Vermont Board of Nursing requirements for LNA licensure. Graduates are eligible to take the state exam for certification as Licensed Nursing Assistants. Sessions meet Monday and Wednesday from 5:00 pm to 9:00 pm and Saturday from 7:00 am to 3:00 pm. The total meeting time is 102 contact hours divided into 42 hours of class time and 52 hours of supervised clinical experience at a long-term care facility. Tuition is $1,050 including the cost of registration. Additional expenses include textbook, immunization, background check, and clinical supplies. A flexible payment plan is available for all students.